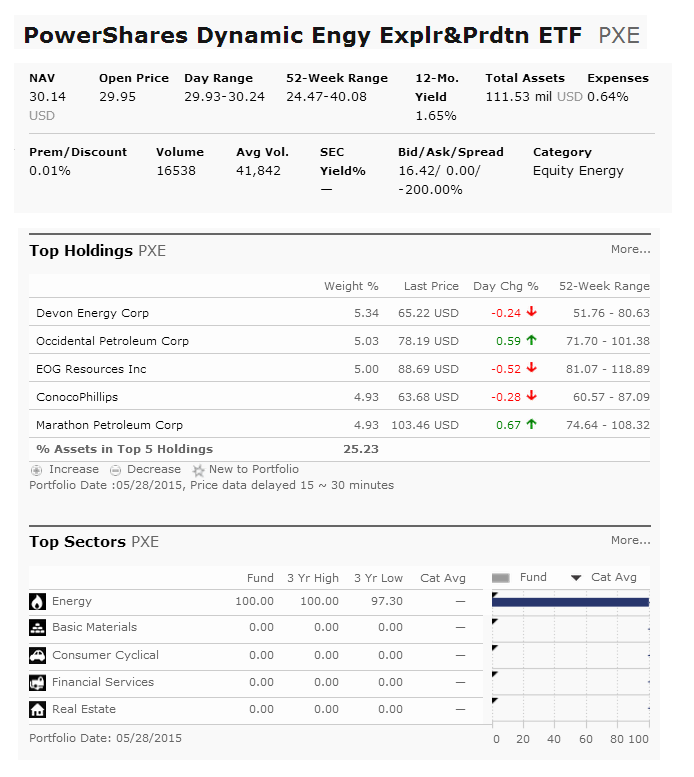 PowerShares Dynamic Energy Exploration & Production ETF (PXE) is an equity energy exchange traded fund. This energy sector fund invests in energy related companies. These companies are engaged principally in exploration, extraction and production of crude oil and natural gas from land-based or offshore wells. These companies include petroleum refineries that process the crude oil into finished products, such as gasoline and automotive lubricants, and companies involved in gathering and processing natural gas, and manufacturing natural gas liquid. It is tracking the Dynamic Energy Exploration & Production Intellidex Index. It has an expense fee of 0.64%. The current yield is 1.65%. With assets of $111 million, the 52 week price range is $24.47 - $40.08. 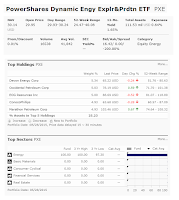 As of June 2015, the top 5 stocks are Devon Energy Corp, Occidental Petroleum Corp, EOG Resources Inc, ConocoPhillips, and Marathon Petroleum Corp. Top sector is energy. Compare to other energy ETF, this fund’s performance has been great. The expense fee is lower than typical energy mutual fund. It can be volatile due to non-diversified nature.